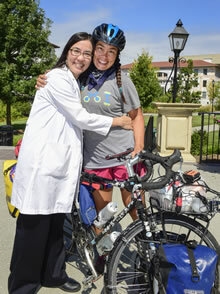 Cyclist and CrossFit athlete, Amy Giver completed a cross-country journey on her bicycle to raise awareness for the Be The Match bone marrow donor registry. She ended her journey at Winship's Bone Marrow Transplant Center. Amy's sister Cindy has been a bone marrow transplant researcher at Winship for 15 years. Giver and her colleagues in the lab of Edmund K. Waller, MD, pursue translational research aimed at improving outcomes and lessening side effects from bone marrow and stem cell transplantation. Winship's bone marrow transplant program is a leader in this area of cancer treatment, having performed almost 5,000 transplants.